The history of Hollywood is filled with legendary director-star pairings. Sometimes the chemistry in these collaborations is so strong that the actor and director return to the well over and over again because they bring the very best out of each other. A few notable filmmaking teams that spring to mind are Scorsese/De Niro, Hitchcock/Stewart, Ford/Wayne, Tarantino/Jackson, and Spielberg/Hanks. 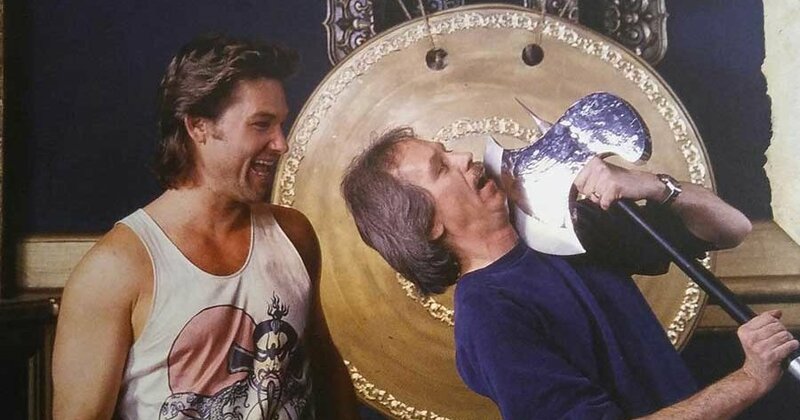 Another successful partnership was director John Carpenter and star Kurt Russell, who produced some incredible movies together during the 1980s. The two men operated on a similar wavelength and were able to work seamlessly towards a shared vision. The duo’s first collaboration was on a 1979 made-for-TV biopic on Elvis Presley. This proved to be simply a tune-up for the pair’s next project, the innovative and influential ESCAPE FROM NEW YORK, in which the two took a purely “B-movie” concept and elevated it to a box office hit and cult favorite in 1981. The pair went right back to work together the very next year on THE THING, a remake of Howard Hawks’ 1951 classic, which ramped up the terror, gore, and intensity and arguably surpassed the original. Each man went on to other projects, but reunited again for 1986’s BIG TROUBLE IN LITTLE CHINA. The movie was viewed as a surefire smash, but it confounded expectations all-around, both with audiences and box office pundits who were expecting something different than the campy genre-bending romp that Carpenter and Russell gave them. It was a decade before Russell and Carpenter reunited for another Snake Plissken adventure in ESCAPE FROM L.A. in 1996. The follow-up to ESCAPE FROM NEW YORK failed to connect with audiences, and it did roughly the same U.S. box office as the original despite having nearly 10 times the budget. The pair haven’t worked together since, but their collaborations still rank among the best work of either man’s career to this day. Read more about John Carpenter and Kurt Russell’s unique partnership here. Jackie Chan’s unique combination of martial arts skill and comedic timing was exactly what Carpenter had in mind for Wang Chi. Carpenter was looking for an actor with the gravitas to play opposite Kurt Russell’s larger than life Jack Burton, and who also had the martial arts skills to sell the movie’s elaborate fight scenes. 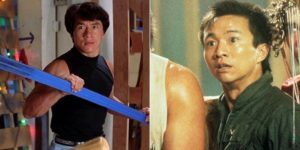 There have been few actors in film history better suited for the role of Wang Chi than Jackie Chan would have been. But Chan was still licking his wounds after the failure of THE PROTECTOR, and was not eager to rush into production on another Hollywood film. Executives at Twentieth Century Fox were hesitant to cast Jackie Chan as well. Producer Lawrence Gordon was concerned that Jackie Chan’s English would not be good enough for a movie that was expected to be a summer tentpole for Fox. Instead the studio opted to go with an up and coming Chinese American actor named Dennis Dun to play Wang Chi. Dun had only appeared in one film up to that point, 1985’s YEAR OF THE DRAGON with Mickey Rourke. Dun was an actor first and only had a meager knowledge of martial arts. But with some movie magic and editing tricks, John Carpenter was able to convince audiences that Dennis Dun was a Kung fu master. Check out this enlightening interview with Dennis Dun.